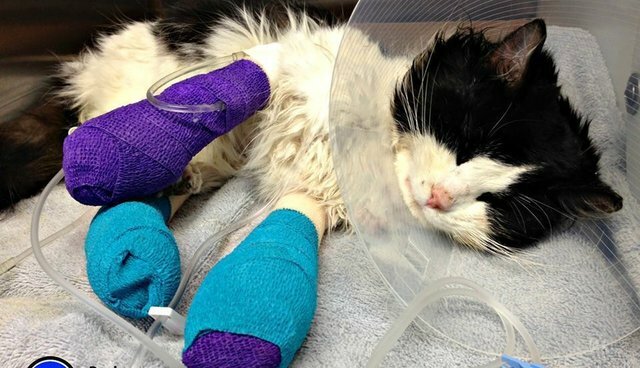 After having his little paws cruelly bound with electrical tape, this brave cat is slowly recovering, and the story of his struggle to survive has touched hundreds of hearts. The cat, whom rescuers named "Bruce Almighty," was found with electrical tape wrapped so tightly around his legs that the circulation to his feet had been cut off. 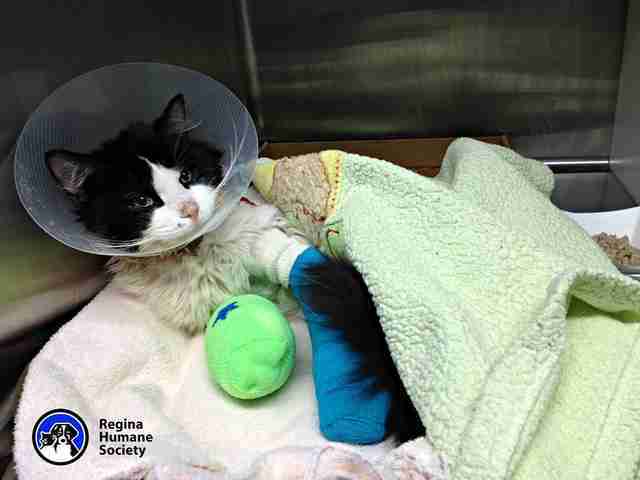 According to a Facebook post by the Regina Humane Society in Canada, where Bruce is recovering, he "collapsed" into the arms of his rescuers, and purred, despite what must have been excruciating pain "as they began the delicate job of removing the tape." The abuse left Bruce with severe infections in his feet, and after the tape was removed he needed emergency surgery to amputate eight of his toes. Even now, there's a possibility that Bruce will need more amputations. The Regina Humane Society set up a fundraising page to help cover the cost of Bruce's care, setting a goal of $5,000. The response has blown them away. In just 4 days, Bruce's fundraiser has raised more than $16,000 and garnered him hundreds of fans from around the globe. Well-wishers have been leaving messages of hope and encouragement for Bruce on the page: "I wish I could take you home, Bruce. I am praying you will find a loving forever home and never have to suffer again," and "Hang in there little guy ... praying for a full recovery!" The hunt is on for Bruce's abusers, as animal protection officers hope someone will come forward with information about who hurt him so badly. While Bruce still has a long road to health, he's got a line of potential adopters who'd be honored to give him a happy, loving home.